Bagster vs Dumpster: Buy a Dumpster Bag or Rent a Small Dumpster? Home > Hometown Blog > Bagster vs Dumpster: Buy a Dumpster Bag or Rent a Small Dumpster? Your remodeling project or household cleanup has left you with a small to moderate amount of debris to get rid of, but more than can be reasonably put in your weekly trash. Should you buy a dumpster bag and have Waste Management pick it up or rent a small dumpster from a local dumpster service? To answer the question, we compare buying a 3 cubic yard Bagster from Waste Management with renting a 10 cubic yard dumpster from a local dumpster service. This is not an apples to apples comparison because a 10-yard roll off dumpster holds 3X more debris than The Bagster. But for many parts of the country, a 10 yard roll-off dumpster is the smallest temporary dumpster available to rent, so this comparison represents the real life options available to most people with a smaller disposal need. The Bagster from Waste Managment is a small, portable, 3 cubic yard bag made of tough, woven material. It's for single use, and you must first purchase the bag. The Bagster is available at home improvement stores and online. After you fill it up, you schedule to have it picked up by Waste Management (WM). WM's Bagster is the most popular dumpster bag, but it's not the only bag out there. There are a few small competitors available in limited areas, such as the Gorilla Dumpster Bag. Renting a temporary dumpster is available nationwide from local dumpster services. Simply contact a company serving your area and learn their rental policies. Set up delivery to your location, and call the dumpster company back when you're done to schedule a pick-up. The Bagster bag itself costs roughly $30, and the purchase price is relatively constant throughout the country. The larger cost, however, is the cost of pick-up. WM's price to pick up the bags varies greatly from place-to-place. For most areas, the cost of Bagster pick-up ranges from $119 to $199 per pick-up, but cost varies significantly. On the extreme high side is New York City, where it costs $307 to pick up your first Bagster ($285.25/bag for each additional bag). A 10 yard dumpster costs more than the smaller dumpster bag. It holds 3X more debris and it must be both delivered and picked up by the hauler. Like the prices for Bagster pick-up, dumpster rental prices fluctuate from one town to the next. Get educated on how dumpster prices work to get the best deal. The rental period included with the price varies by hauler, but 7 to 14 days is common. If more days are needed than the hauler's standard period, the dumpster service generally charges a per-day or per-week fee on top of the normal cost. With such a wide price range across the US, you really need to get prices specific to your local area. Calling a couple local haulers is the best way to get an accurate price for your location and debris. For a general idea, we've surveyed hundreds of dumpster rental costs throughout the United States to give you an idea of what you can expect to pay in your area. Bottom line on cost: The Bagster is cheaper overall, but a lot more expensive per cubic yard of debris capacity. Let's use Atlanta, GA as an example. The total cost for purchase and pick-up of a 3 cubic yard Bagster is $170... or $57 per cubic yard of debris held. Renting a 10 yard dumpster in Atlanta averages around $260...or $26 per cubic yard of debris capacity. The small size of the Bagster is its biggest limitation. The Bagster is only a good choice if you have 3 cubic yards or less of debris. WM's bag is 8 ft. long, 4 ft. wide, and 2 ft. 6 in. tall. It can hold up to 3 cubic yards of waste, or 606 gallons. Because the Bagster is only 2 ft. 6 in. high, large bulky materials, like a sofa or other large furniture items, are not going to fit well. To understand more about cubic yards and dumpster capacity, see our Ultimate Guide to Dumpster Sizes. 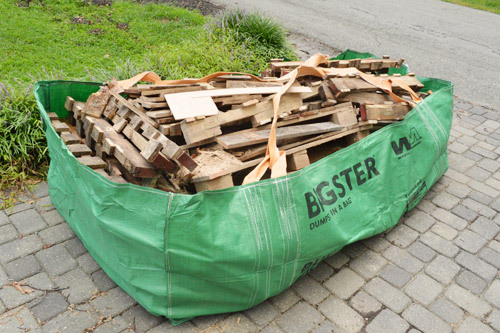 The Bagster is a good choice if you have 3 cubic yards or less of debris and your individual items are not overly bulky. As its name implies, a 10 yarder can hold up to 10 cubic yards of waste. 10 yard dumpster dimensions vary by hauler, but a common size is 12 ft. long x 8 ft. wide x 3.5 ft. tall. Is a 10 yard dumpster right for your project? You can load up to 3,300 lbs. of debris into the Bagster (provided it meets all other size/fill requirements). The amount of weight included in the price of renting a 10 yard dumpster varies by hauler, so look closely at the "included weight" when renting a dumpster. Anywhere from 1 ton to 3 tons of included debris weight is common (2,000 - 6,000 lbs). Generally, if you go over the included weight, there is a "price per ton" for the additional weight. Price per ton for additional weight depends on the disposal fees charged by landfills in your area. $35 to $55 per ton is common in the many parts of the country, with $80 to $100 per ton not uncommon on the coasts. Just because the dumpster bag is small and portable doesn't mean you can place the bag anywhere. If you place the bag in your side yard or backyard, away from truck entrance points, WM won't be able to snag it with their truck and crane. Bagster placement is generally in your driveway or on your front lawn toward the road. Of course, leaving a Bagster on your lawn for days or weeks will kill the grass underneath, so generally a driveway is the best option, if available. Dumpster placement is generally on your driveway, parking lot, or possibly in an alley or on the street. Some cities prohibit dumpsters on the street or require a permit. Ask your dumpster service for advice. Roll-off dumpsters are generally 8 feet wide and the trucks that pick up these containers are a similar width. If available, driveway placement is generally preferred. If placing near the garage, be sure the hauler leaves enough room for your dumpster door to swing open and your garage to be accessible. Discuss dumpster placement with your hauler. Typically, the materials allowed in a Bagster and a dumpster are very similar. Most all types of construction and demolition debris, household junk, and heavy debris, like bricks and cement, are allowed. With the Bagster, whether yard waste is allowed depends on your location. Paint, chemicals, hazardous waste, propane tanks, and appliances are a few of the restricted items that are never allowed in a Bagster. Check out these bag filling guidelines for a complete list of what is and isn't accepted in a Bagster. Because the two get dumped in the same place—the landfill—what you can and can't put in a dumpster is very similar to that of a Bagster. Prohibited materials can vary by hauler, so be sure to check with the dumpster company you choose to see what is and isn't allowed in the dumpster. Time to Decide: Bagster or Dumpster? Which works better for you—buying a 3-yard Bagster or renting a 10-yard dumpster? The answer really depends on the amount of debris. If you're only pitching 3 yards or less, a dumpster bag is a great option. But 3 yards of capacity fills up quick. If you're unsure if you'll have more than 3 cubic yards, the safe bet is to rent a dumpster. Don't be surprised if the things you want to get rid of multiplies after you have the dumpster bag or the dumpster. Getting rid of debris and junk is almost always contagious. It feels good to cleanse yourself of unneeded stuff, and you'll almost always find more to get rid of.